Gas Lantern Media | audio, video and words in review: The Andrew Bird Show. Andrew Bird brought his amazing, erudite, artsy indie-folk rock to the Ogden Theater in Denver last night. And I was there. 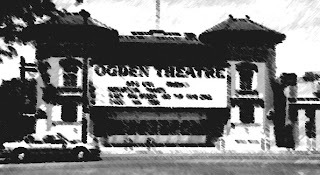 I've seen many shows at the Ogden, and this was the most populous of any of them. He will be at the Fillmore next time, likely to sell out the larger venue... easily. Granted it was all ages, so there were many kids branded with the black X on their hand-backs milling about smoking pot and drinking $2 bottles of water... mixed with the usual 21+ crowd. The number of younger kids surprised me, partly because it means that high schoolers today seem to have much more discerning tastes in music than I recall from my day. My school was filled with kids who liked new-pop-punk, kids who liked reggae and jam, kids who liked 311, pot and ecstasy, and then the oldies kids (Beatles, Stones, et al) of which I was a member. Music is better now that it was, though. The mid-90s post-grunge era was a wasteland of pop-one-hitters. And these kids like one of the less accessible, most educated artists in indie rock. The kids ARE alright. The show itself was brilliant. Loney Dear, of Sweden, opened the show with some solid pop-folk numbers loaded with great vocals, sweet harmonies and even an audience sing-a-long. (As often happens, it took till the third go round for the bulk of the show-goers to belt anything out... and even then it was more a light cooing.) Ultimately the music was solid singer-songwriter indie with a focus on vocals as an instrument rather than as a conveyance for lyrics. Most of the songs had a couple of verses, a chorus or bridge, and then winding measures of folk scatting. Emil Svanängen, the man behind the sound has a smooth, syrupy, and breathy (but not John Mayer breathy) voice. He's also an exceptionally kind human being. I caught him at the merch set-up and we spoke briefly about his touring of the States, and how great an opening act he was for Andrew Bird. He last toured with Of Montreal, whose theatrical bombast would be a massive tone shift following Loney Dear, and was very complimentary and thankful for the turnout in a middle-America city like Denver. Then, enter Mr. Bird. His set was nothing short of spectacular. Using a multi-pedal system, Andrew looped and overlaid whistling, violin string pluckings, bowed riffs, and guitar work to make the entire sonic experience full and nearly studio clean, but not lacking in character. (The Ogden has always been my favorite Denver venue for sound quality, and Bird cranked that assessment up a few notches.) He opened with songs from the new album Noble Beast. Then he rode right into "Plasticities" and "Imitosis" from Armchair Apocrypha. He admitted to composing one of the new songs from the album while on a fly fishing trip with his father in Winter Park--to the cheers of his Colorado crowd. And his stage presence is particularly arresting, in that he is both incredibly intelligent, but also affable and unassuming. For a man who writes songs laden with $5 words, he never spoke over the heads of his crowd. Andrew Bird put on one of the greatest shows I've been to in recent memory, with the skill of a showman and the humble air of an open-mic'er. He is someone you must see live. Now, I'm going to go buy and learn how to play the violin, since it is the greatest rock instrument of a new indie era.